Virgin Atlantic is in talks with Lufthansa about the future of UK airline BMI, in which Lufthansa recently acquired a controlling stake. Sir Richard Branson's airline said in a statement that the talks may or may not lead to an agreement. Mr Branson himself has been highly critical recently of British Airways holding talks with other airlines. He described the merger talks with Iberia and Qantas as being both "unholy" and anticompetitive. 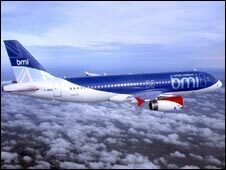 Lufthansa bought 50% of BMI from its chairman Sir Michael Bishop in October as part of a long-standing agreement. It took Lufthansa's holding to 80%, and made it the second biggest presence at Heathrow, behind British Airways. Mr Branson said a tie-up between Virgin and BMI "would make us a stronger competitor to British Airways than we are today". He also stressed that the two airlines do not currently have any routes in common. In a statement, the German flag-carrier said: "Lufthansa can confirm that it is exploring options regarding the future ownership of BMI." "These options include different scenarios." Is the worst over for the airlines?